In a time when cursive handwriting is fading from many classrooms, calligraphy is making a surprising resurgence. While carefully hand-lettered invitations, place settings and envelopes tend to be reserved for weddings, many calligraphers find themselves working on a variety of celebrations and other projects. Maybe you’ve always received compliments about your handwriting or practiced calligraphy as a hobby over the years. The time may be right for you to hone your skills and start letting your friends and family know you’re taking orders. With rates for envelope addressing alone ranging from $2 to $5 each, calligraphy could be a lucrative side hustle. Want to take up calligraphy as a part-time gig? Here’s how to maximize your success. Set aside $100 for supplies like nibs, ink and paper, but look for starter kits from well-known calligraphers. Laura Hooper offers a starter kit on Etsy for $65, with various add-ons as you build your practice. But be prepared to get caught up — you’ll probably find yourself wanting more supplies rather quickly. Ink colors alone could be a budget-buster. 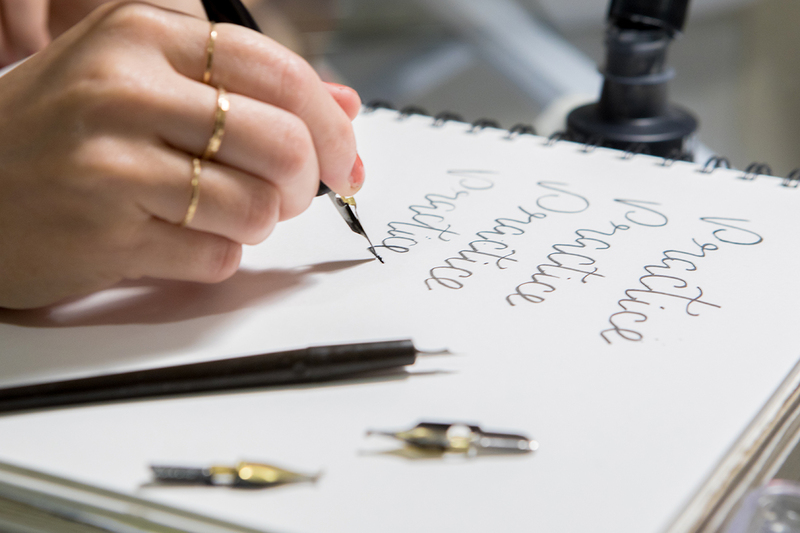 If you’re new to calligraphy but have a knack for cursive, start by taking an introductory class taught by a pro in your area. This training can set you back up to $300 for a half-day class, but it’s a worthy investment to get hands-on help and troubleshooting. You also usually get basic tools to take home. Once you know the basics, you can continue to learn through free online courses like Skillshare or by searching for YouTube channels dedicated to certain elements and skills. Lyndsay Wright, owner of Lyndsay Wright Design, is a Dallas-based calligrapher who offers classes at local stationery shops as well as at chains like Paper Source. Wright has a professional background in architecture and design and started practicing calligraphy on the side while attending graduate school. She encourages novice calligraphers to exercise patience. Use word of mouth advertising to your advantage and take time to evaluate the first few projects you complete for pay. Did you enjoy one type of task more than another? Many calligraphers focus on hand-lettering for events. Some take on unique projects like lettering wedding vows or a speech. Still some work on mastering their lettering style before creating it as a digital font. But when she wants to stretch her boundaries a bit, Wright can rely on one of her more prominent clients: the Dallas Mavericks basketball team. “Working on projects for the Mavericks is always challenging and exciting, because their desires and visions for what the lettering will be are usually a little out of my comfort zone,” she said. What’s your favorite social media tool? Use it to promote your work — shamelessly and often. In fact, social media helped Geer notice the rising popularity of hand-lettering. Now, you can spy her works in progress on Twitter and Instagram. Seeing tons of followers, but not a lot of transactions? Keep building relationships. When a friend or follower has a project to tackle, you’re likely to come to mind first. Elizabeth Walker is an herbalist in Alberta, Canada, but still feels a pull toward the artform she first picked up as a child. “Join a calligraphy society or guild in your area,” she encouraged. “Don’t just learn from books. You can deceive yourself into thinking you’re better than you are at calligraphy if you work in a vacuum.” She suggested attending calligraphy conferences, if possible. Sounds like solid advice for any side gig. If you’re invested and loving it, trust that you’ll make your investment back through your client work. The Art Career Project estimates that a full-time calligrapher can make about $50,000 per year, but that estimate might not include side offerings such as ready-made products or teaching classes. And as a side hustler, your mileage is likely to vary. Varying demand for calligraphy services through the seasons (get ready for those summer weddings!) can result in busy times for your side business that can contribute heartily to your household income. Lisa Rowan is a writer and producer at The Penny Hoarder. Hand-lettered titles done by Kristy Gaunt, Illustrative Designer at The Penny Hoarder.